Create Scripts & Macros Faster and Easily! Havnt downloaded the .exe, but did the code run it and got an error straight away. You must be running the original AHK, this code requires AutoHokey_L because of the modified Hotkey command box. I didn't write this part myself, here is the original post (credits included). Without that it wouldn't be possible to enter combinations like Ctrl+Enter. Updated to v1.1 and fixed the input delay for combinations (ctrl, alt, shift). I'm working on a built-in recorder to make it easier to create macros. Has anyone checked? I would really like to see some comments. Wow, it's So powerful and complicated. Good job, Pulover! nothing is impossible with ahk (_L). I started with a much simpler project, but I just kept having more ideas and it became kind of a challenge. Hehe... But it's actually useful for me and I'm having fun trying to get it all to work. Your Recorder inspired me to try and make a recording feature as well. I hope to update it soon. - Loop: it should "wrap" around selected rows in the listview? - Help: perhaps show/lookup function of AutoHotkey command? I can see something like this included or recommended during a first time AutoHotkey install. Well, thank you! I'm glad to know I'm in the right path. You could do some work on the Gui and add some control flow features like IF. I didn't know about Jibit, I will take a look but I can see some good things to use in my app. About the control flow, you can already enter any script command going to the Text window and selecting the 'Script' option. This way, anything written there will be passed literally to the AHK file, so maybe I could put some shortcuts in this gui to help with that. - Icons in listview for certain actions. I think it could use some icons too. Once I get the recorder going I will add the icons using the shell32.dll as you suggested. - Why not choose your own, "pcsv" or "acsv"? Sure! I hadn't thought about that, but now I will change it. Maybe "pmc"? That's a very good idea. I will play around to see if I can get it done already. That's exactly what I was thinking. Just don't know yet if I should use tooltips or a context menu link... I will spend some time on that soon. - Added Beta Recording Function (settings can be changed in Options Menu). - Made Mouse Actions editable. - Changed 'Loop' function behavior. It will now automatically create the loop start and end around selected rows. - Added Icons to ListView. - Changed default Delay value back to 0 and created a separate value for Mouse Delay. It can be changed in Options Menu. - Fixed: Holding a modification key would cause a false input. - Changed Column name 'Command' to 'Action'. - Changed File Extension to "pmc" to allow future association with the Macro Creator. Thanks the Guest for the suggestions! Recording is still in tests. Currently it can record pressed keys, mouse clicks, mouse drag, double clicks, mouse wheel, mouse movements (off by default). It can only record mouse actions relative to the active window. You can use the Preview window during recording to see the resulting script. I will add more options and features in the next updates. 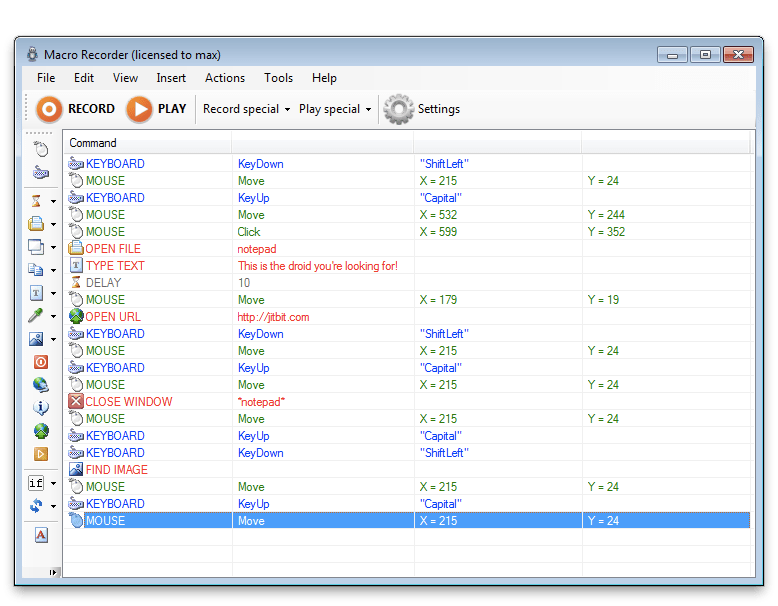 - Added Relative Mouse Clicks recording (Hold CapsLock to record clicks and drags relative to the initial position). - Added Window Class and Title recording. I think the Relative Recording is going to be an useful feature. Still have to work in a few more things, though. Like Control Recording. - Added Ini Support: Current Settings will be saved on exit. - Added Click Down/Up record option: It allows movement recording while holding a button (useful for Hand-Drawing). - Added option to use Key Toggle State to set Relative Recording On/Off. - Added Timed Interval Recording. Now you can use the Click Down/Up option along with the Mouse Moves Record to create precise Hand-Drawing (precision will depend upon minimum delay). Hold down CapsLock to record relative to initial position. Thanks for the program! I was wondering how or if it's possible using this to create like a sequence function (if such exists). This is probably a newb question but...Let's say I want to create a single macro to open Window "X" with the mouse only on 1 press and then on the second press it would close the window "X" using the mouse only. Then on the 3rd person open.. etc. Thanks for trying it, kbanny! I understand what you want, it deals with Flow of Control. I plan to add shortcuts for If commands soon, but it's already possible to use these commands in Text window selecting the Script option. Although it will not work in Playback mode, I'll show you how use it to create the script. By the way, I fixed an issue with the Run command, so please download it again to update. - Double-Click the Run command in Row 2 to choose the window you want (works just like windows Run, you can use folders or url too). - You need to get the name or class of the window: Click the Window button, you don't have to select a command, just select between Title or Class and click the Get button. Open the window of your choice and right-click anywhere to get title/class, then copy the text. Now close the window. - Edit and change the text "ahk_class CabinetWClass" in rows 2 and 3 with the copied text. - Now click Export and change the key in Hotkey box to a valid mouse button (LButton, RButton, MButton, X1 or X2). You can set up an Abort Hotkey to exit the script. Also you can use a Tilde to keep the button normal function if you need (i.e. ~MButton). - Select destination and click Export. Now you can execute the exported AHK file and it will check if the window exists, if it doesn't the run command will execute, if it does the window will be closed. If you need to know more about the commands just check the AHK documentation. And feel free to leave any questions or comments!